Mark Tinsky Estate Pipes | Chicago's Pipe, Cigar & Tobacco Store | Iwan Ries & Co.
About the most frequently question asked of me, is, how did you get into pipe making? "I usually plant my feet, make sure my bowl is lit, and say, "It's a long story, are you sure you want to hear it? "If the response is favorable I proceed. The story of pipe making in the 80's is a story in its self deserving of a fuller treatment than I can give here. I will address this subject more completely in later writings. There are many stories, many personalities, and a whole era to recapture. For me this was a happy time. I got married had a child. Had time to pursue personal interests after concentrating solely on the business for so many years. We were accepted by the Pipe World in general. We made various club pipes for PCI magazine. We were in many retail catalogs. I went to Europe to and stems directly. Things were going well and we enjoyed the recognition and fruits of our success. My current interests include fly fishing, reading, and writing about pipes over the Internet via Alternate Smokers Pipes newsgroup and Pipe DigestI see a great future in this new form of communication and it has begun to change the way I'm doing business already. I can now deal directly with customers as I could never do before. I've met many intresting people who have used computer programs to design pipes. I plan to straddle the line between retailers and direct sales by protecting a retailers local territory. Its a big country and now with the Internet, a big world! I'm sure there's room enough for me to do business without upsetting too many people. I plan to do further writings about people, stories, and experiences I've had in the pipe industry. 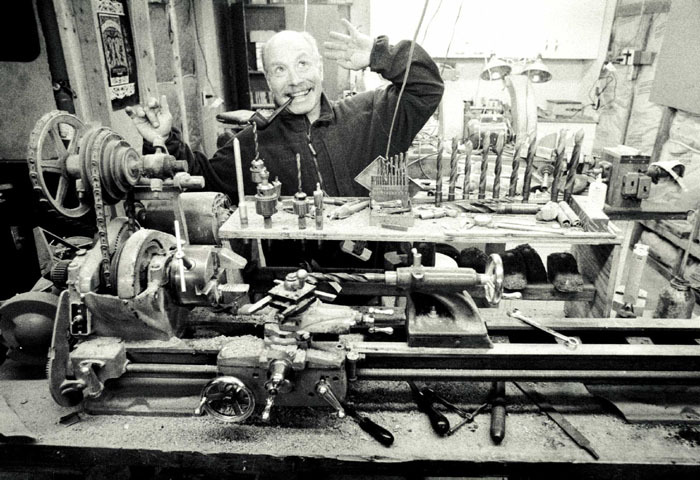 I've collected some of my writings on pipes in a section called Musings from the workbench. If you're interested, please look for further updates. Time for a new bowl of tobacco. With the renaissance in pipe smoking I ve gone back to being a full time pipe maker. Certainly , my first love! My biggest problem is trying to wade through my list of custom order pipes. I can never seem to get caught up. Just once in a while I'd like to work on a few of my own designs! I'm not complaining business is great and I'm making pipes again. We'll have to see what the rest of the decade brings but its wonderful to have reached the point where everything I make can be appreciated and quickly sold. While I certainly haven't reached the lofty status of some of the European makers as Curt and I had dreamed of doing 20 years ago; at least nationally I do have some positive name recognition for which I'm grateful! Maybe the next generation of American pipe makers will put us over the top.